This is the recipe I’ve given out more than any other (apologies to those of you who already have it). It’s DH’s favorite dinner, it’s full of veggies, and my kids will still eat it–in fact, they prefer the veggies in this to the chicken, which is a statistical impossibility. Defying the laws of nature, gang, right here. I like this because, for the most part, it’s a dice-and-dump recipe. And it freezes gorgeously for those who like to stash meals away. Whip up some rice, nuke this, and voila. Dinner. And a healthy one at that. You’d be disturbed to see my recipe card for this one, as stained and torn and generally ugly as it is. We eat this that much. I hope you enjoy it. ps–I got a request this week for lunchbox ideas. Those are coming soon, including lots of thoughts for nut-free options. Check back! Coat your Crockpot with nonstick spray. Toss chicken, peppers, and onion inside. In a bowl, mix together brown sugar and cornstarch. Add reserved pineapple juice, vinegar, water, and soy sauce. Whisk together until smooth, and pour over the chicken and veggies. Cook on low for 7 to 9 hours. An hour or so before serving (15 minutes is fine, but an hour is better), stir in pineapple chunks. Serve over rice. I will stand up and raise my hand and tell you straight-up that I don’t understand Little Bites. My son, however, will vehemently stand and tell you how much he wants those overpriced, chemical-laden muffins packaged in little pouches and craved by elementary school students everywhere. I think they taste like plastic, to be perfectly honest, and don’t like giving my kids so many additives (not to mention the high-fructose corn syrup)–especially at close to $5 a pop–but they beg. So last year, I got my June Cleaver on and made my own. I mean, really. They’re mini-muffins. Mix, bake, package, freeze. Done. Nothing chemical, nothing icky, and about 50 cents for the whole stinkin’ batch. I found a recipe online that was good, but I did a few things: I lowered the fat in them, incorporated whole-wheat flour, upped the vanilla, and decreased the amount of chocolate in them. Then I got some snack-size zipper top bags and packaged them three or four to a bag. Those little bags went into a gallon-sized freezer bags, and are always ready to be tossed into a lunchbox or field trip bag. Easy peasy, kids. Know what? Having had these, my kids now think little bites taste a lot like their packaging. And I didn’t even have to lecture them on that one. Cool, no? Heat your oven to 375 degrees and spray mini-muffin tins with cooking spray (I like the Pam with Flour, but any kind will work) Cream together shortening and sugar. Beat in egg, milk or water, and vanilla. Stir together flours, baking soda, baking soda, and salt, and add to wet ingredients. Stir in chocolate chips. Spoon into mini-muffin tins and bake about 10 – 12 minutes, until they spring back when touched with a finger. Let cool a few minutes in the tin, and then remove them and cool them the rest of the way before packaging and freezing them. These are also good without the milk and with a mashed banana added to the batter–bake them a few extra minutes. 🙂 This recipe doubles beautifully. A few weeks back, I had a craving for the barbecue chicken pizza of a California-type of restaurant in the mall near my house. DH hates the mall. Passionately. And so, we had a dilemma. Thankfully, I also have a pizza stone that lives on the bottom rack of my oven. If you’ve not yet invested in one, I highly recommend it. Just leave it in the hot box all the time and it’ll be ready whenever you want excellent pizza or crusty bread or crunchy cookies. They are fantastic toys and no-maintenance: I scrape mine off into the trash can with a metal spatula (after it cools, of course) and put it back into the oven for next time. No muss, no fuss. The thing I don’t like about the pizza restaurant’s barbecue pizza is the red onions. Red onions are great in moderation. But they toss them willy-nilly all over the pizza and to be honest, it’s a bit much. So I went with Vidalia onions (any sweet yellow will do) that I caramelized in a low cast iron skillet for about a half-hour in a little butter and olive oil and just a touch of salt to help bring out the liquid. 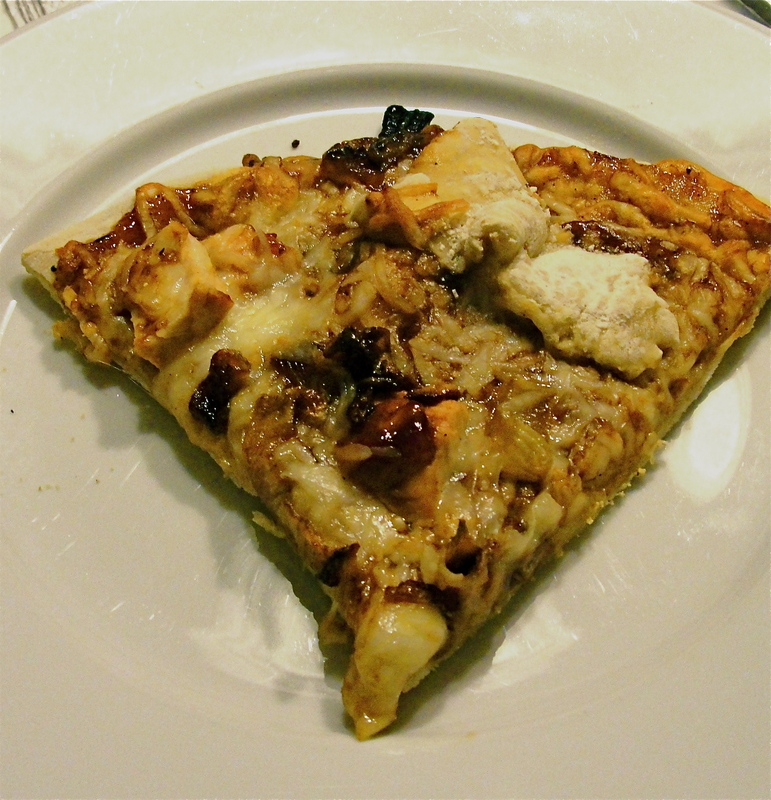 The rest is easy: chicken breast that you cook any old way (I did mine in the oven while the pizza stone heated–you want that puppy hot hot hot when you slide in your crust) and bottled sauce and shredded cheese. Huge hit. Tremendous. But if your kids aren’t into barbecue just yet, it’s easy enough to make a traditional tomato-and-cheese pie for them just before you make this yummy recipe for the grown-ups. Pizza stones are fantastic that way–once they’re hot, you can go and go with pie after pie. Just refresh the cornmeal on there to keep everything from sticking. Shredded cheese. I actually like a Mexican blend for this, but a combination of mozzarella and cheddar is absolutely wonderful too. Heat your oven to 400 degrees with the pizza stone on the bottom rack. Let this go for a half-hour or so before you’re ready to cook. 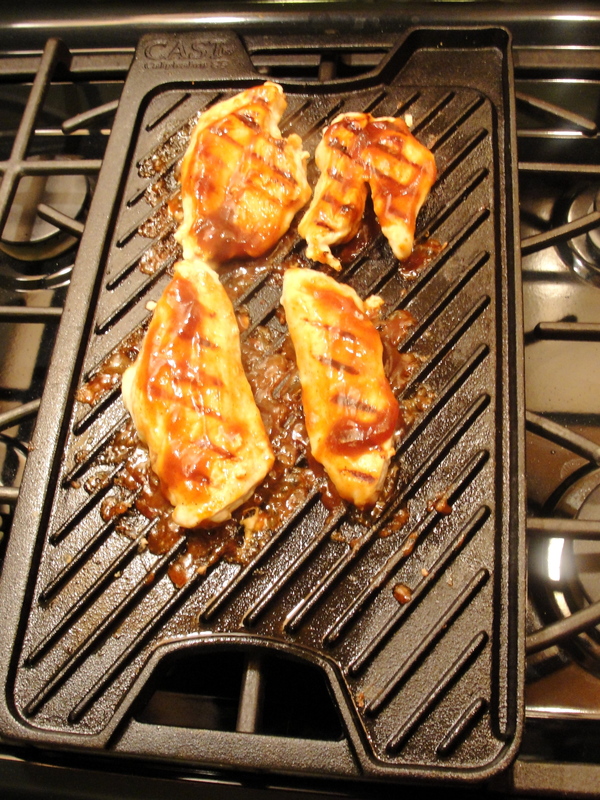 While the oven gets hot, pop in your chicken breast with some of the barbecue sauce in a little pan. Let it stay in there until it’s cooked through (about 10 or 15 minutes) but not dry. Cut it into bite-size chunks or shred it. Prepare your crust. Poke holes in it with a fork (keeps a lot of air bubbles from forming), and layer your barbecue sauce, cheese, sweet yummy onions, and chicken on top. This is a great thing for kids to help with, by the way, and I sometimes make the crusts into individual pizzas and let everyone make their own. Way fun! Sprinkle cornmeal onto your pizza stone and gently slide your pie into the oven. Cook it for 10 – 15 minutes, or until it’s reached your desired doneness (I like my cheese a little brown). Remove from oven. Slice and yum. This is a big favorite in my house, and no visit to the dreaded mall is required. I hope it is in yours, too. You know how you start the new year out with a resolution and the best intentions–all kinds of fired up to eat better or exercise more or stop smoking or lose weight–and by mid-February, it’s all out the window? That used to be me once a week, in the produce section. I’d hit the rows of fruits and veggies hell-bent on bringing healthier food into my house and transforming our family’s diet with natural vitamins and fiber, and then four or five days later, I’d chuck wilted celery and yellowed broccoli into the trash. Because when push came to shove, it was just too much of a pain in the neck to haul out another pot or pan and a knife and everything else I’d need to cook fresh vegetables in their traditional ways. Then, gratefully, I discovered the magic of the microwave. The microwave is a miracle for fresh vegetables. That’s because you can steam them with a single bowl or microwave-safe dish and nothing else. No steaming rack. No grill pan. No heat in the room. Honestly. It’s that easy. And now when I bring asparagus or green beans home from the market, it’s actually eaten, and it’s delicious. 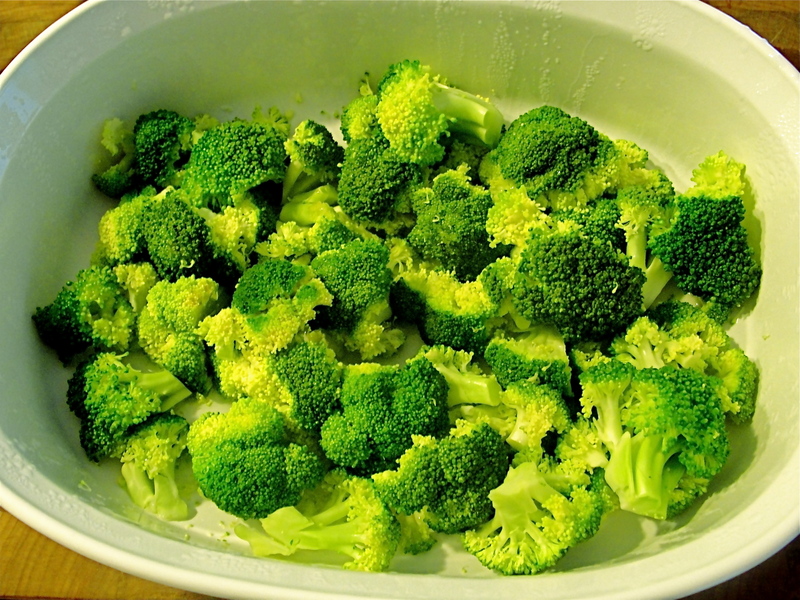 Veggies of your choice: broccoli, asparagus, green beans, baby potatoes, squash…almost anything. Place your veggies into your dish in layers, using seasoning between layers if you’d like to. Add about two tablespoons of water to the dish; I try to ensure it gets to the bottom, underneath the food. Put the lid on or cover tightly with wax paper. Wait a minute or two. Remove the lid, season as you like, and yum. Yesterday was one of Those Fridays. You know those Fridays? Three errands to run, several hours of work to do (interrupted, oh, a thousand times by bickering, whining, end-of-summer children; I love them, I love them, I love them. ), two hours at the pool to placate said end-of-summer moppets, showers, a mountain of paperwork and bills, and then…dinner. Dinner. I forgot about dinner. These are the nights I’m thankful for frozen salmon. I buy big bags of frozen filets at Sam’s Club just for nights like Friday–nights that would otherwise find us wolfing down delivery pizza or greasy Chinese food because life got in between me and the stove. They defrost in a snap in a bowl of lukewarm water and they cook in no time, with so much natural flavor that they don’t need a lot of spices or sauces on top. DH had another late night at work, which meant we were eating after the kids’ bedtime again–not unusual for many of us, I’m sure. So I defrosted the salmon in water while the kids showered and put a pot of rice on the stove. 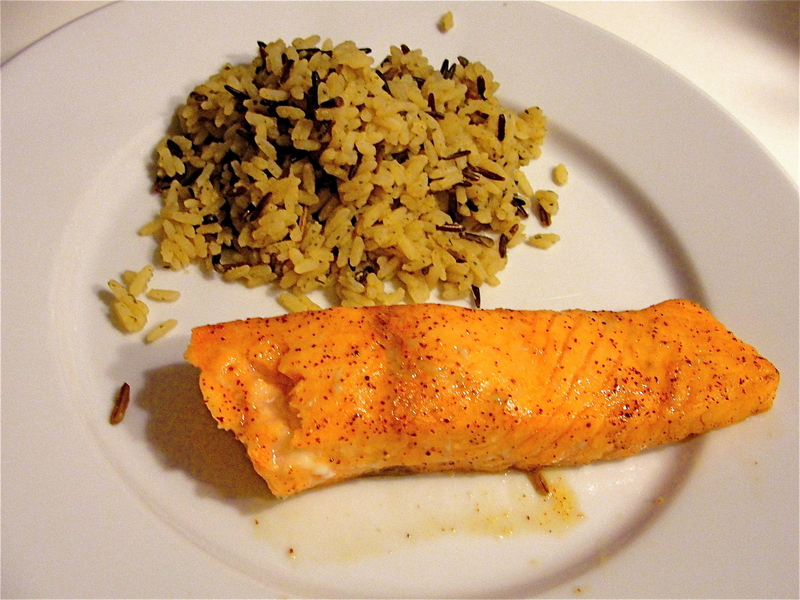 The first way I cooked salmon was for the kids, and it couldn’t be simpler. I used salmon and honey. That’s it. Spread the honey on top of the salmon and bake it at 400 degrees for about 15 minutes, or until cooked through. It’s sweet and delicious with a beautiful golden crunch on top, and they gobbled it down. Hello, Omega 3s, and nobody fussed! Score! DH and I have different tastes in fish, so I lined two small baking dishes with foil and sprayed them with olive oil. His fish got just a sprinkle of lemon juice and some pepper, and then the same baking treatment as the kids’. If I’d had fresh dill, I’d have chopped some of that and sprinkled it on top of the cooked fish, but I didn’t and he didn’t miss it. Easy peasy. I’m a little more complex, but it’s still really easy. I threw my fish into a plastic bag while the kids’ fish cooked, with about a tablespoon each of honey and lime juice, and a few pinches of chili powder. And then later, that baked for about 10 minutes; I like my salmon rare (raw, if I can get sushi-grade, but rare if it’s frozen and I trust the source). So DH’s and my fish went into the oven at the same time, and I just pulled mine out a few minutes earlier than his. So that’s salmon three ways, with no pans to scrub thanks to the foil and just a few simple ingredients. We ate a healthy, delicious dinner that made everybody happy, and I didn’t have to tip a delivery guy. Yesterday was one of those days that flew by in a flurry of paper and phone calls and errands and STOP TOUCHING YOUR BROTHERs and Advil. Several doses of Advil. One of those days when I hit the bed at the very end and realized I’d been breathing all along, you know? DH works in another state one or two days a week and on those days, I’m never quite sure what the evening’s routine will bring. Normally, he comes through the door about a half-hour before the kids go to bed, and by the time he gets changed and spends a few minutes with them before we brush teeth and tuck them in, it’s well past 8 p.m. And we’ve not yet had dinner. There are a few ways to work around this so we’re not eating dinner 10 minutes before we pass out from exhaustion. 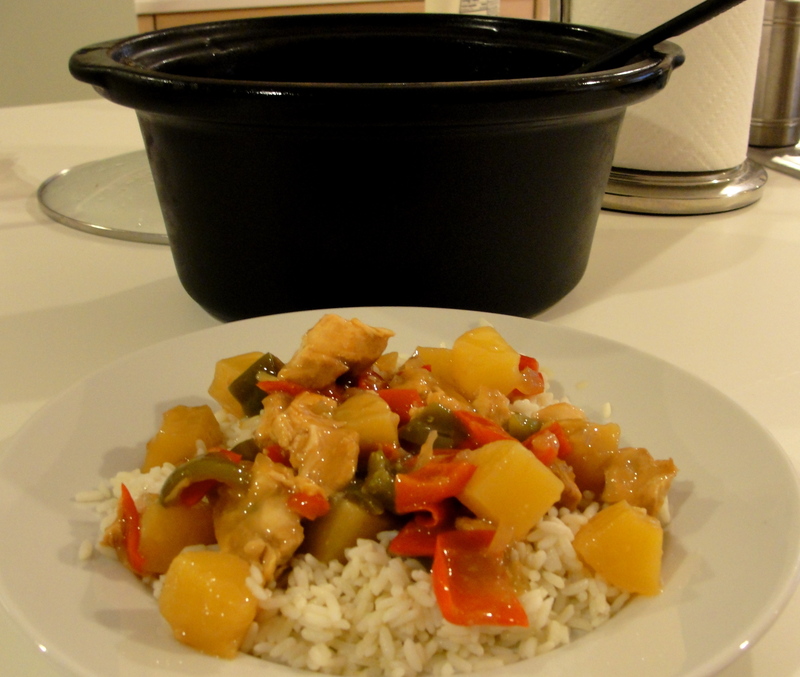 The slow cooker is a godsend and I use it frequently, but tend to pull it out more in the colder months. I’ve also learned to make an entire dinner earlier in the day and pop it into the fridge to be re-heated later, but yesterday didn’t offer me a full hour anywhere to do that. I call them “hurricane days,” and find the best way to work around them is to figure out how to piecemeal dinner together. Which is what we did yesterday, and we had a hot, reasonably healthy dinner on the table 10 minutes after the kids went to bed. The first part of this is menu planning: the easiest way to figure this out is to have one thing that can be served cold (it was a tomato-cucumber salad last night), one thing that can be cooked ahead of time while other things are going on and re-heated later (a boxed wild rice blend), and an entree that can be prepped during the day and tossed into a pan for a bit at dinnertime (I did barbecued chicken breasts). I had a pocket of time yesterday afternoon that involved some note reviewing for an article I’m working on. It was easy to bring the laptop up to the kitchen and sit at the table with my “real” work while the boxed rice mix simmered away on the stove. Rice microwaves beautifully, so cooking it while I was doing something else nearby and putting it in the fridge made total sense. The kids ate dinner around 6. About a half-hour before that, I pulled a package of chicken breasts out of the freezer and defrosted them in a bowl of lukewarm water (which doesn’t threaten to start cooking them like the microwave can). I cut one up into strips, breaded them, and sauteed them into chicken fingers, which were served with some of the rice from the fridge and a banana. Kids fed–awesome. While they ate, I butterflied the remaining breasts all the way through, to create four thin pieces out of the two whole breasts. Those went into the fridge, and I pulled my double grill pan out of the cabinet and set it on the stove. When I went upstairs to brush teeth and say goodnight to the not-so-little ones, I flipped the burner under the pan to medium-high; cast iron takes awhile to heat up, and the 10 minutes I was upstairs was perfect. I also pulled the chicken back onto the counter so it could come up to room temperature a little bit. Back downstairs after kid bedtime, I sprayed the grill with olive oil spray and put the chicken on it to start cooking. While that went on, I chopped up the cucumber and tomato for our salad. Waited five minutes, flipped the chicken over, and started brushing it with barbecue sauce (I like Kraft honey barbecue, but that’s me). Long and short, the chicken cooked, I heated up the rice, and we had dinner on the table by 8:15. Which is not bad at all for a hurricane day. Tonight, we’ll have leftovers; I have a class until 8 and need to shower after, so popping a plate in the microwave will be the only way we’ll eat at a remotely reasonable time. Anyone else have great strategies for crazy-busy days? I’d love to hear them. I woke up to the sound of rain pounding against the house this morning. We live in a 70-year-old Cape Cod with a steep-pitched roof, and rain like this is deafening up in my room. It’s an all-day rain, too. Soaking. Were it five degrees cooler outside, I’d break out a pair of old, faded jeans and one of my well-worn college sweatshirts. There are definite plans for a hot cup of tea and a half-hour’s curl-up with a book in my favorite stuffed chair later, and we’ll be digging into my double-top-secret toy stash this afternoon to keep all the short people occupied and content. It’s a day for comfort food, and that starts with breakfast. Today’s recipe is baked eggs, which are warm and soft and subtle, and emerge from the oven in round ramekins or ovenproof mugs that fit in your hand just perfectly on a cold, wet day like today. These are super easy–if you can break an egg, you can make these–but they do take a little while in the oven. Get them prepped and baking and go take your shower. By the time you’re dry and dressed, your breakfast will be waiting. They’re also very simple to customize. Like ham? Dice some up and layer it into the bottom of your dish. Tomato? Same thing. Anything you’d put in an omelet is great in these–spinach, mushrooms, bacon, onions, you name it. And it’s delicious with just a few tablespoons of jarred spaghetti sauce on that first layer in the dish. Promise. Baked eggs are a great brunch dish if you have individual ramekins for everyone, and they’re fun to prepare like an omelet bar, letting everyone choose their fillings before you pop them into the oven for a few minutes. You can do these with a single egg or two egg whites and an egg; just decrease your baking time accordingly. You want to pull these out of the oven when they’re slightly undercooked, as the heat from the ramekin or mug will finish them off. I like mine the texture of poached eggs, with a cooked-but-runny yolk and set whites, but you can make these to any doneness that makes you happy. They’re happy eggs. The perfect way to start a rainy day (or any day, really). I hope you like them. Heat your oven to 375 degrees. Spray a ramekin or ovenproof mug with olive oil. Line the bottom of your dish or mug with your bottom layers–the tomatoes, veggies, or meat, or combination of all of the above. Break eggs into the dish on top of them, and sprinkle the top with parmesan if you want a nice crust. 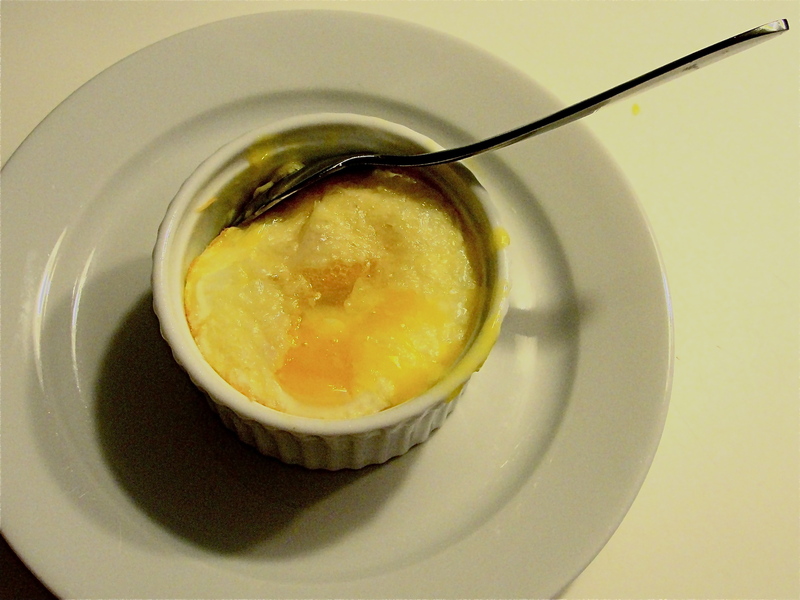 Put your ramekin into the oven on a baking sheet (to save yourself any possible mess) and bake it about 15 – 20 minutes for two eggs, or until they’re slightly underdone. Remove from oven and let cool for a few minutes before you eat.